It’s been a whirlwind sort of week. Today is the last day of school for my kids for the year. I’m thrilled – I’m tired of getting up at 5am and tired of driving. My boys are just tired of going to school. We’re all ready for a break. Yesterday was my daycare kids last day of school and their last day with me. They’re both getting older and they recently moved about half an hour away. We’ll still see them, of course, but it’s hard. I’ve had these two since the oldest was 18 months old and the youngest was two weeks old. They’re now 14 and 11 and like sisters to my boys. It’s going to be weird and a little empty around here without them. Wednesday was the 5th grade field trip. My son, Corwin and I, along with 74 other fifth graders, their parents and teachers, went to Greenfield Village. It’s a park where tons of historic buildings have been moved to preserve them. They have the Wright brothers’ family home and bicycle shop there, Thomas Edison’s labs and a ton of other buildings. They also have preserved Model T cars that you can tool around the park in as well as a steam engine train, working farms, and working artisans – glass blowers, tin smiths, potters and I think a blacksmith. 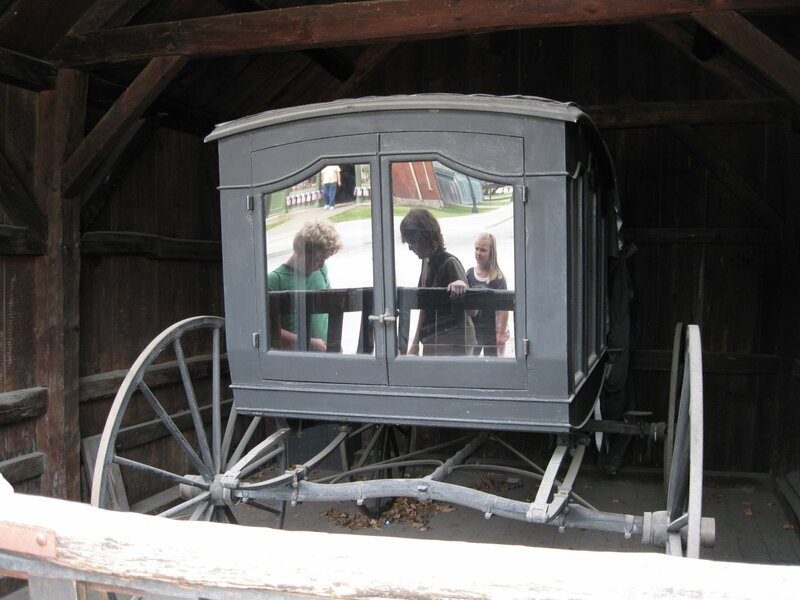 This is a picture of an old horse drawn hearse with my son and his friend’s reflection in the back window – Corwin has the darker hair. I just thought it was a really cool picture. It’s fascinating. I could have easily spent all day there, but we also had the Henry Ford museum on our schedule. It’s definitely the place for car and plane lovers. There were all kinds of vintage planes and cars there along with tons of other museum-y type things. The big display this year was Cars and Guitars. The display had guitars and guitars belonging to different rock stars over the years – from Elvis to Metallica. They had a smashed up Pete Townsand guitar along with a drum from Keith Moon’s drum kit so I had to get pictures of those as the hubby is a giant Who fan. Greenfield Village is about three hours from my house. I wanted to ride the bus because I loathe driving in traffic where the median speed is 85 mph and people dart in and out of lanes like toddlers on speed. Unfortunately, my daycare girlie’s 8th grade graduation was that evening and there was no way I’d make it be in time, so I had to drive and follow the psychotic bus drivers so Corwin and I could leave early and get to the graduation on time. Have fun, Bron. You deserve it. And yes, isn't it great when school is finally out and you have time to catch your breath. How lovely. Yes you were a child bride! Happy Anniversary and Happy Birthday! Have a great weekend, Bron! I'm glad you had fun at Greenfield Village and the Museum. Happy Anniversary!!! I hope you and the DH have a great weekend! Happy everything! You deserve it! Sounds like a lovely field trip. Much more enjoyable than the one we take with out seventh graders. No one should have to spend four hours on a bus with 70 13 year olds.